What bullet weight for a 10 1/2" 223 AR; heavy and slow or light and fast? I'm a reloader and thinking I'll split the baby and load some 65gr SGKs. These would be for social work. I'm offended by people that are easily offended. I think I would go with the tried-and-true 55-grain. The .223 / 5.56x45 is, after all, just a .22 caliber firearm. The effectiveness of the round is derived foremost by the upsetting, or tumbling, of the bullet when it strikes and enters the target medium. Everything I have read tells me that a minimum velocity is needed for that upsetting to occur. Assuming a standard M16 barrel length, for example, the newer 62-grain bullets will reliably upset out to a shorter maximum effective range than the older 55-grain. 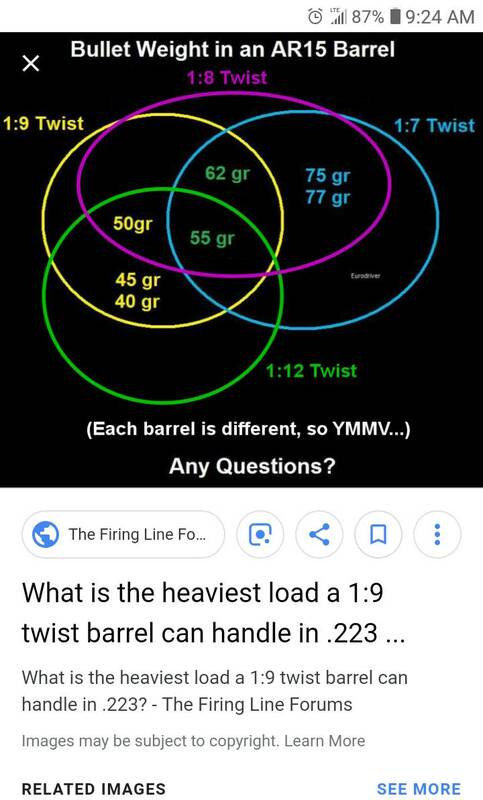 You're using a barrel of half the length of the M16, which will reduce the bullet's muzzle velocity and thus will reduce the distance out to which the bullet will reliably upset upon impact. Therefore, I would be very concerned about the distances within which you anticipate using this firearm for "social" purposes. How "social" do you want to be? Got back from the range and chronoed my standard 55gr ball with 25gr of H335. MV is +/- 2700 which surprised me; I expected <2500. I'm going back Tuesday and really look at some different loads, especially in medium and lighter weights. As to how social, I live very rural Texas/ Mexican border. I live in an Hispanic world, folks are kind, hard working, etc. I'm also a realist and there are some things that happen on all borders in the world that I don't want to be involved in. The only time I was actually shot was at a little over 100 yards according to law enforcement. I carry serious fire power in my truck but for a handy light gun around the house, 50-100 yards is probably good enough. BTW, I'm not a kid but staring 70 in the eye. I assume your chrono velocity was "muzzle" (actually probably 10 or 15 feet) velocity. According to The Ammo Oracle ( https://www.ar15.com/ammo/project/term_velocity.html ) both the M193 and M855 bullets need 2500 to 2700 fps to fragment reliably. The fragmentation is a result of the upsetting, so you're looking at 2500 fps as an absolute minimum, and 2700 fps for some cushion for reliability. But that's not muzzle velocity, that's velocity at the point of impact. So now you need to factor in how much velocity your bullets lose over a distance of 100 yards. In addition, if you aren't using the M193 or M855 bullets, you need to find out the minimum velocity that your bullets require in order to upset and fragment reliably. I don't know of anyone who tests and publishes that sort of information for aftermarket, commercial .223 projectiles. If you can't find it, you may have to invest in a couple or three blocks of Clear Ballistics Gel and start shooting it at 100 yards. Or just use the 55-grain M193 bullet and call it good. Interesting, few of these reports seem to be coming from troops 20" or SAW platforms. It would seem that the additional velocity from the longer barrel provides adequate usable fragmentation range for M855 in the majority of cases. From shorter barrels, such as the M4's 14.5" barrel, M855's fragmentation range varies from as much as 90m to as little as 10m, which frequently isn't enough range. Last edited by Aguila Blanca; April 7, 2019 at 02:41 PM. Using a Lab Radar, velocity drops off from 2700 at the muzzle to 2500 at 50yds. I haven't run the software to see what a 100yds would be but it'll be slow. BC on 55 grain bullets is not spectacular...mid 300s. I have shot coyotes out to about 500yds with Hornady 75 match, bullets using a 24" barrel and a MV of 2860. Bang flop. Srelok says they're still making 1870 at 500. Apples and oranges but it gives me some place to start. I'm curious what the MV will be on the 75s; low 2000s for sure. Coyotes are varmints. People hunt coyotes out to 100 yards (or maybe more) with .22 Magnum. You are asking about "social" situations. You need to make more than a .22 caliber hole. That means either an expanding bullet, or a tumbling/fragmenting bullet. Those 75 Hornadys do expand. Yes, I know they're "Match" bullets but they leave big exits on #30 animals. A person wouldn't think it but I've seen it. I just don't know at the moment what the 100yd velocity will be. A little experimentation is certainly called for. With 1:7 twist, I would probably try to find something in the 62-68grn range that it likes. If you expect to shoot at, say, 100yds, or wish the capability to do so, that's where I would test your load at. Reason I say that... my 1:7 H-bar displayed a serious dislike for the 55grn bullet, but yours may be different. Is this a AR pistol or SBR? My 1:7 barrels prefer bullet weights in the 72-77 grain range, with Hornady's 75 grain BTHP as my go-to for hog hunting and home defense. 1:7 is a fast twist that likes heavier bullets. My basic 55 grain ammo is most accurate in my .223 Wylde 1:9 barrel. My 10.5" AR pistol is loaded with Prvi 75gr OTM. Here are links to two videos of gel tests with that ammo. The first is with am 11.5" barrel and the second a 16" barrel. Mine do very well with 75gr Hornady bullets, loaded with either TAC or CFE 223. All of my 5.56 loads with stick powder are "meh" at best, and all the ones I've loaded with spherical powders are a cut above in accuracy. (Use at your own risk) but so far my favorite load is the 75gr Hornady BTHP Match as burr described, with 24.1gr of TAC and a CCI Small Rifle Magnum primer, loaded to 2.25" OAL so they still fit in the magazine. This is a chart I found online. It gives a general idea what SHOULD work with a given twist rate. My understanding is that velocity also plays a large part in how a bullet will stabilize. That's a nice diagram. Thanks. I'll agree a 1 in 7 is a good twist for the 75 gr Hornady Match BTHP. I suggest you NOT try the 75 gr A-Max.It just won't work loaded to magazine length. I truly do not know what bullet would be most effective for you. You are not restricted by any military rules about non-expanding bullets. Something like a 62 gr Varmint Ballistic tip might cause a lot of trauma,but it may not penetrate light cover. Berger hunting VLDS have a rep for trauma. I think there is a 68/69 gr A-Max that would make a hole. The new Sierra 77 gr MKs with the plastic point might open. Answers require testing and a give and take on tradeoffs. A varmint bullet might be compromised by a yucca bush. Some of the Barnse copper deer/hog bullets might be worth a look. I suggest you NOT try the 75 gr A-Max.It just won't work loaded to magazine length. In 5.56 my house social load is a 55 grain Nosler Ballistic tip. I built a AR Pistol in 40 S&W that takes Glock mags. With the hot 155's in the 8.5" barrel I am using it actually outperforms a 5.56 from a 7.5" barrel. It is magnitudes quieter as well. 75gr hornady is my favorite pill in all barell lengths. The hornady website has pics of it in ballistic gel testing at diffrent velocities. My 10yr old killed 2 deer with them from a 16" tube they left a nasty wound channel. 70gr Hornady GMX monolithic will be stable in 1:7 and much higher BC at lower mass (the weird benefit of gilding metal solid bullets that no-lead hunting laws have pushed us to). They expand beautifully, and 2800fps in 16” barrel in my reloads, so probably near 2500. But here is a table for that bullet at 2500. There is a 55gr GMX also which will be higher velocity in short barrel and still better BC than usual 55gr, it will reliably expand, and has 100% weight retention when it does. I use the Hornady 75 OTM for general shooting in AR and high power competition for 200 and 300 yards, and the 75gr ELD-M at 600, but that’s not loaded to magazine length. The 73gr ELD can be loaded magazine length but will be going slower in your barrel. The Hornady Black SBR focused ammo is 75gr Interlock type lead tip jacketed bullets. It is supposed to be fast powder for shorter barrels, works fine in my 16” guns. Can’t get those bullets to reload tho. NRA Life Member, CRPA member, Calguns.net contributor, CGF / SAF / FPC / CCRKBA / GOA / NAGR / NRA-ILA contributor, USCCA member - Support your defenders!